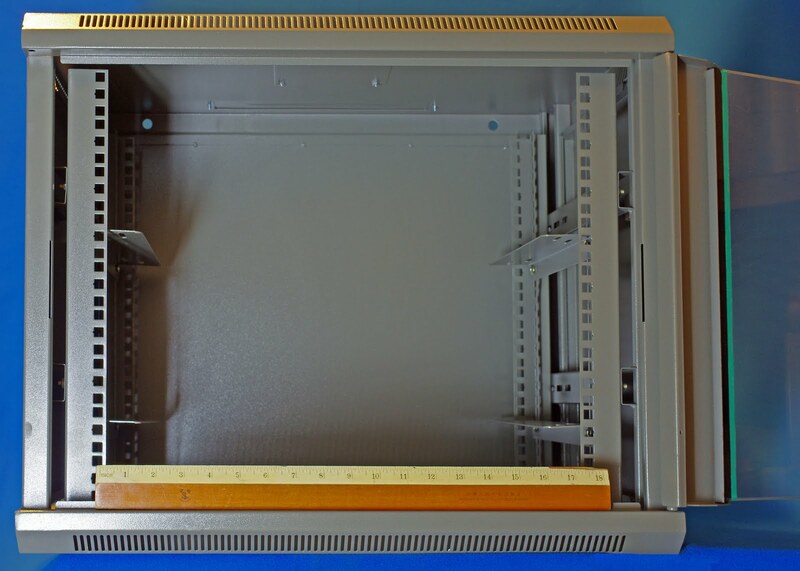 Below is a picture of such a 19" cabinet. The glass door has been opened so one can clearly see the innards. The most important things no notice are the 'pillars' with square holes in them on both sides of the cabinet. 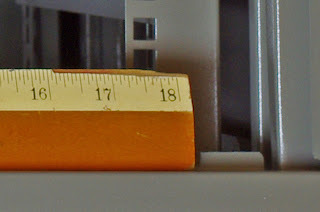 An old ruler has been placed at the bottom of the cabinet; it dates from the 1960s and is therefore marked in inches. The crop below shows that the distance from hole to hole is about 18". 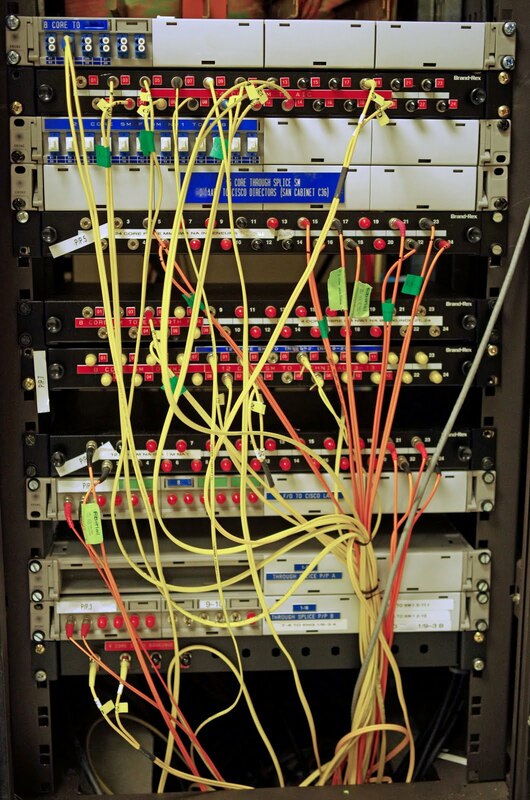 In a real network many units will be fastened to the cabinet. The picture below is an example that shows a typical installation. 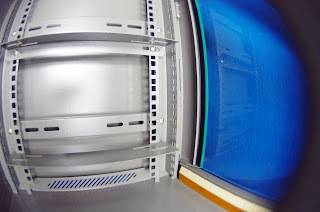 Careful observation reveals that each of the pieces of equipment in this cabinet is exactly three holes high - somewhat more precisely they are 44.5mm high. The height of a cabinet is measured in units, abbreviated as U. 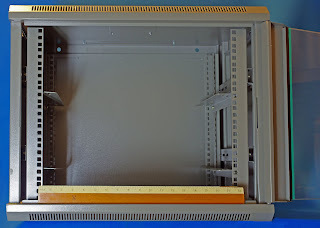 Counting the holes in the cabinet above (27 holes) reveals that it is a 9U cabinet. 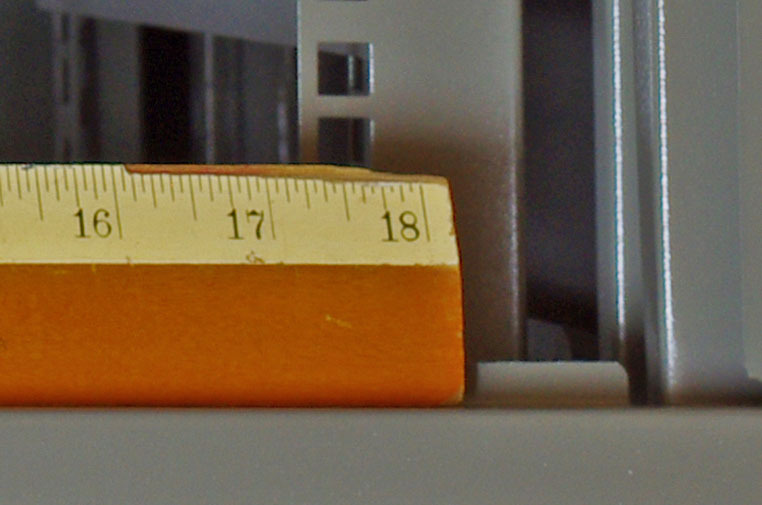 Since the top and bottom of the cabinet in the picture below are not visible, it is not possible to determine its size from the picture. At least eleven units are visible in the picture, with spaces between some of them. This cabinet is obviously much bigger than our earlier example. 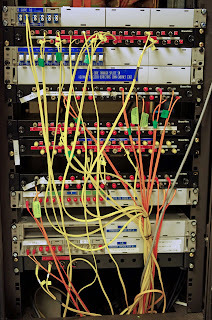 Note that some pieces of equipment may be larger than 1U - a rack-mountable computer may, for example, be 2U high. Here is the earlier cabinet again, this time from the inside. The rounded shape is distortion caused by the lens used. This cabinet has some horizontal pieces of metal, which is unusual. The most important piece of metal in this picture is still the pillar on the right with its holes that face the glass door. 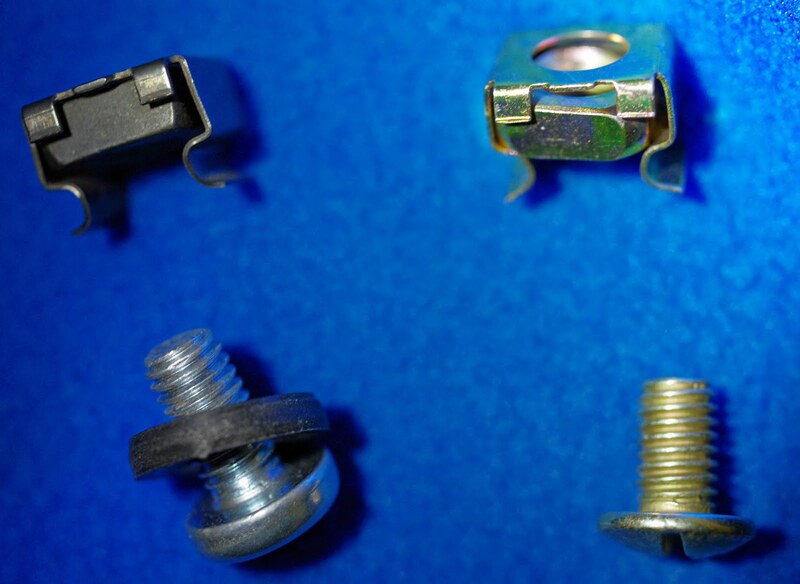 The traditional way of fastening equipment to the cabinet is by means of bolts and cage nuts. Note the two nuts in the picture below are indeed in their own little cages. A closeup makes the nature of the cage even clearer. 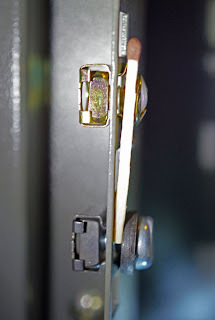 To use the cage nuts they are clipped into the square holes of the front pillars. 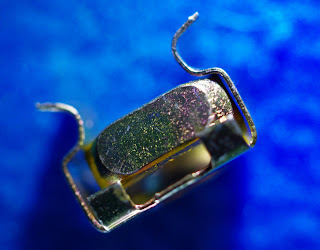 The picture below shows how the caging clips into the hole and the cage then holds the nut in place. 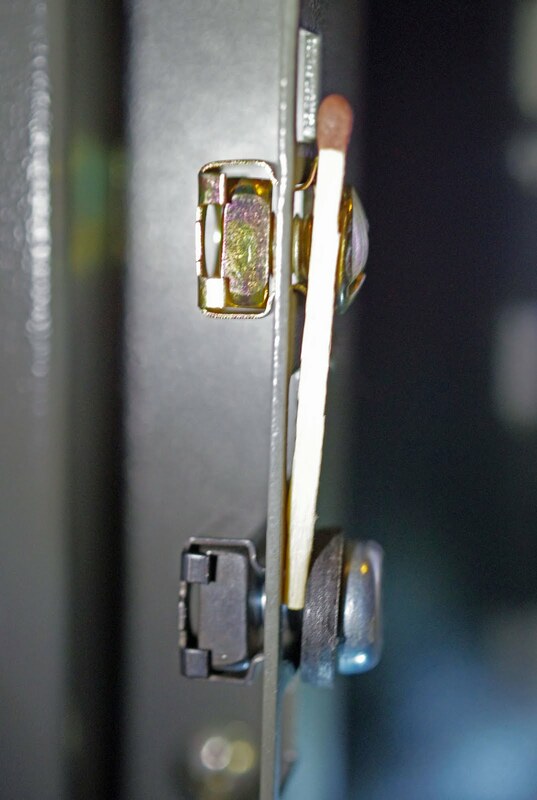 It is now possible to fasten a piece of equipment from the front without having to try to hold the nut at the back. In the picture below two bolts have been screwed into nuts. In this case they hold a matchstick - to indicate scale. These two screws have one hole open between them. The matchstick is therefore about 1U high.